Following on from the first viruscraft workshop, we can now start planning the viruscraft game. The field of virology from genetics and interactions on the microscopic scale to the spread of disease and it’s effects on the ecosystem is huge, so we used the workshop primarily to identify the core things that are the most important to convey, and promising ways we can use to explain them. Getting high quality feedback so early on has allowed us to get a good sense of what is important with a diverse mix of people – the things that they picked up on (and just as importantly the things that they didn’t) saves a lot of time – and sharpens our focus right from the start. Phylogeny is the name given to a kind of family tree that shows the evolution and development of species over time. Ben’s work is concerned with how viruses can jump across species, so the concept of phylogeny is central to his work. There is also something very concrete and humbling about hearing the time scales involved here – nearest common ancestors of related species of fruit flies (his model organism for study) being tens of million years distant, while you need to go back 800 million years to find their common ancestor with us. These numbers are hard to grasp, but at the same time put things into perspective. Playing with and visualising long time spans will be an important aspect of this project. Viruses and their hosts are very different, hosts can be any creatures from bacteria, plants or animals while viruses seem little more than self replicating geometric shapes. Despite these differences, viruses and hosts have a huge effects on each other’s evolution – viruses need to spread and infect as many individuals as possible, but if they get ‘too good’ they kill off their hosts and they die off too. We’ve dealt with the co-evolution of hosts and diseases before in the red king sonification project, and again here the dynamics between competing organisms needs to be a central theme. Our workshop participants found it surprising that one of the defining aspects of a viruses success is down to shape – e.g. whether you succumb to a cold or not is down to the ‘lock and key’ connection which needs to happen for the virus to attach to receptors on a cell’s external structure. These physical forms are the most promising area for viruscraft in terms of game mechanics – particularly if we are thinking about physical, tangible interfaces. As an arms race situation between the host and the virus, our butterfly mimicry game for Cambridge university is a good reference for how a game mechanic can work in this context, as it accelerates evolution over the course of a minute or two as you play. Given these themes we can now fill out our initial sketch a little with the new scientific information we learnt from the workshop as well as the feedback and ideas. 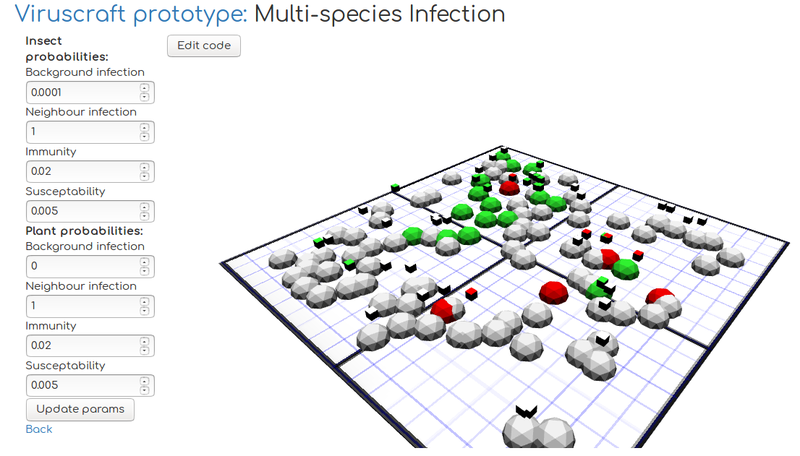 One major addition is to add phylogeny as a kind of racing game in reverse, with time heading backwards so you can see the effects of your virus on a population, and also gives us a way to visualise your virus skipping between species. Like the Inca, we travel backwards into the future, giving us a view on biological history. 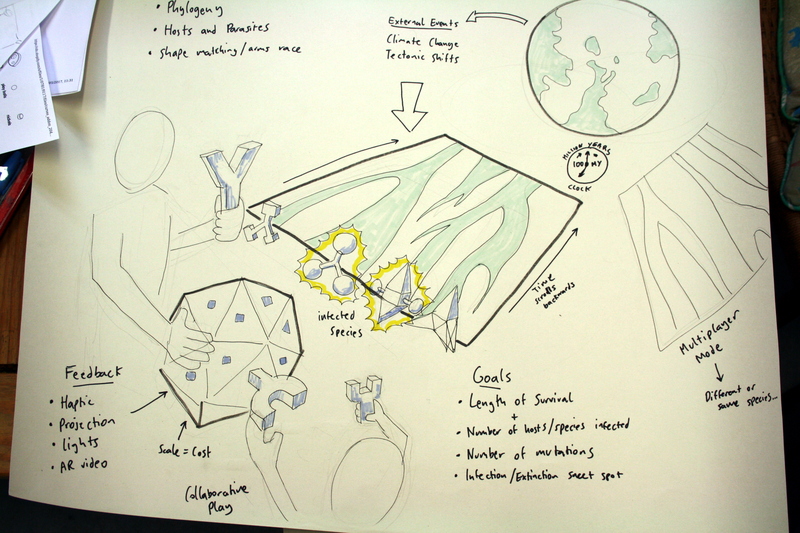 The primary game mechanic controlling the species jumping and virus success in general is combining shapes based on receptors on the host cells – this is very roughly shown above, the virus is currently attaching to the spherical receptors and infecting those host populations, if one of the players plugs in the shapes they are holding they will jump across to infect one of the other species too. The precise nature of this needs to be realistic enough that players get the idea that this is actually how things work rather than a metaphor, but schematic and abstract enough that it’s simple enough to understand within a few minutes of play. The other aspect of the shape matching is that the relatedness of host species should be reflected in the receptors in some sensible way (closely related ones should be similar) – so we need a procedural ‘receptor combination generator’ to make matching interesting, with zillions of possible combinations. Another limitation is that of feasibility with regards to building a tangible interface. Luckily we have a few stepping stones that give us a range in terms of cost and risk. One of the activities from the workshop was building a large virus capsid out of bamboo – which led to a large scale modular origami climbing frame crossed with a dance mat as a grand vision, incorporating feedback consisting of haptics, lighting or projection mapping. In terms of practicalities (and budget) we need to get there a step at a time. We can start by building a screen based system for manipulating the virus structure and shape matching, as it needs to be able to work in browsers anyway for accessibility – so this is a good place to begin. Once we have this working we can test the game properly and move on to building a smaller scale tangible interface, like in the sketch above – perhaps based on the pattern matrix technology, primarily designed for exhibitions and family groups to play with together. The underlying model or simulation that is being manipulated is unusual for us in that it does not have to be a scientific research model, so we can design something that is realistic enough for educational purposes but no more. This is the next priority, and we can build on our viruscraft prototypes by having a model based on individuals navigating a mesh of connected nodes that alter to represent dynamic geographical changes (formation of land bridges and islands). The phylogeny chart can then be a separate visualisation of this same process (with references to futuristic driving games such as f-zero and wipeout). Time may run matched to the earth’s time line, so perhaps every day starts at the appearance of mammals and ends with the present day – the world map could match earth, or could be an alien planet. We can have external events to liven the game up, perhaps if you are doing too well your hosts could in impacted by climate change, asteroid strikes or tectonic shifts.